In this demo Federica will show you how to perform, with simple moves, the expression of the mischievous little girl. She will teach you how to paint and create fantastic nuances, using both powder and paste colors. 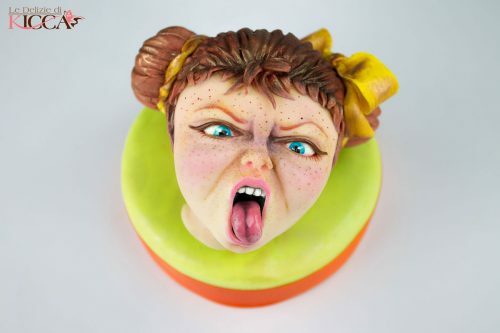 Federica Cipolla, in art "Le delizie di Kicca", is an Italian Cake designer. In 2013 she started working as a sugar artist. In the last two years, Federica has specialized in the sculpting of characters on underwire, the material she loves the most, and the plastic chocolate with which creates and shapes her characters. Among the many prizes she received, the 3rd place in the Italian artistic pastry shop 2015. In 2014 and 2015, Federica won second place in the gold category at the Birmingham Cake International. In 2017, again at Birmingham Cake International, she wins a golden mention in the Master class category. In 2015 of Cake International in Birmingham, Federica was the protagonist with two demos at the theater. In 2016 she was nominated as a finalist in the EAG Modeling Award category of the Edible Artist Network held in Hong Kong at the International Bakery Expo. In 2017 Federica made her debut in the United States of America as taught at the "Cake Faire" fair in Orlando 2017.